Samsung has announced the launching of Galaxy Note 8 to be August 23, 2017. While on my twitter news feed, i came across this tweet by Evan Blass, shared some images of the upcoming Galaxy Note 8 along with a link to Venture Beat post. According to venture beat article, the phone will come out of box with a 6.3 inch Quad HD+ Super AMOLED display and its screen resolution will be 2960×1440 pixels (~522 ppi pixel density). One impressive feature i love about this upcoming Galaxy Note 8 its ability to be water and dust resistant for about 30 minutes since it is expected to feature IP68 Certification. 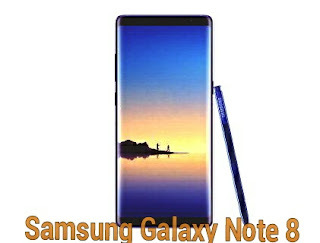 Galaxy Note 8 is indeed a handy smartphone as it has its dimensions as 162.5 x 74.6 x 8.5 mm (6.40 x 2.94 x 0.33 in) and it is built with Corning Gorilla Glass 5 back panel. The smartphone is expected to be powered by 6GB RAM to keep it running and avoid any slowdown in performance, with Galaxy Note 8 users should have a better space for storing their files as the smartphone is made with a 64GB built-in storage space and also supports MicroSD Card of up to 256GB for perfect storage. Of course we must discuss about Camera quality in every detailed Smartphone specifications. The smartphone supports fingerprint sensor and Iris scanner to let users set personal security on the phone. It also features other sensors like accelerometer, compass, SpO2, heart rate, proximity. So above are the discussed specifications of Samsung Galaxy Note 8. Do share this post... Thanks for visiting Oshetech.